Spanning almost two decades of Erwin Schulhoff’s output, this programme includes the rarely heard Neun kleine Reigen, one of the composer’s earliest works to exhibit the influence of both jazz and light music, as well as the Suite dansante en jazz, one of the last of his works to be overtly indebted to jazz idioms. The six intimate and humorous portraits of everyday life with a child which make up Ostinato show the influence of Expressionism and Dada. The album concludes with Zez Confrey’s ragtime Kitten on the Keys to which Schulhoff pays his own tribute in the last movement of Cinq Études de Jazz. Caroline Weichert was a pupil of Renate Kretschmar-Fischer at the Musikhochschule in Detmold, and also studied with Conrad Hansen, Vitaly Margulis and Yvonne Lefébure. A prize-winner at the Busoni, German Chopin and Schubert competitions, she has appeared regularly as a soloist with orchestras such as the Baden-Baden Philharmonie, Nordwestdeutsche Philharmonie and the Telekom-orchester. She received a Discobole award from the Académie du Disque Français for her recording début featuring works by Shostakovich. 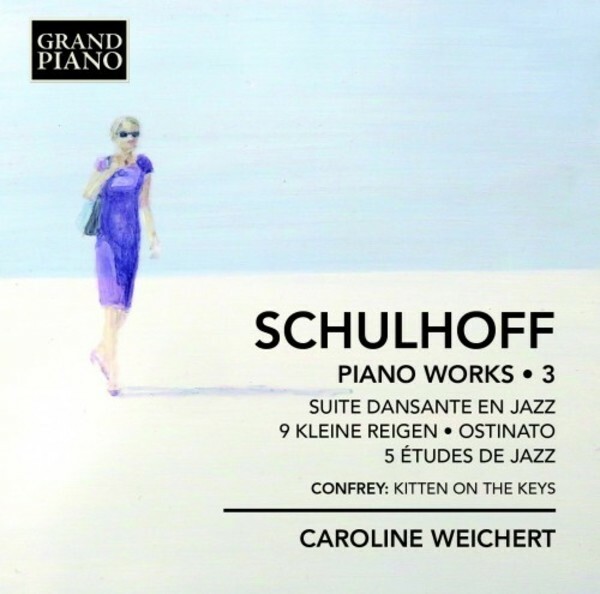 Weichert’s first recording for Grand Piano, Schulhoff Piano Works Vol.1, received wide critical acclaim, including the prestigious Choc de Classica and Pianiste magazine’s Maestro awards.